This Gun-Control Activist Helped Plan the March for Our Lives. Now She’s Running for Congress. 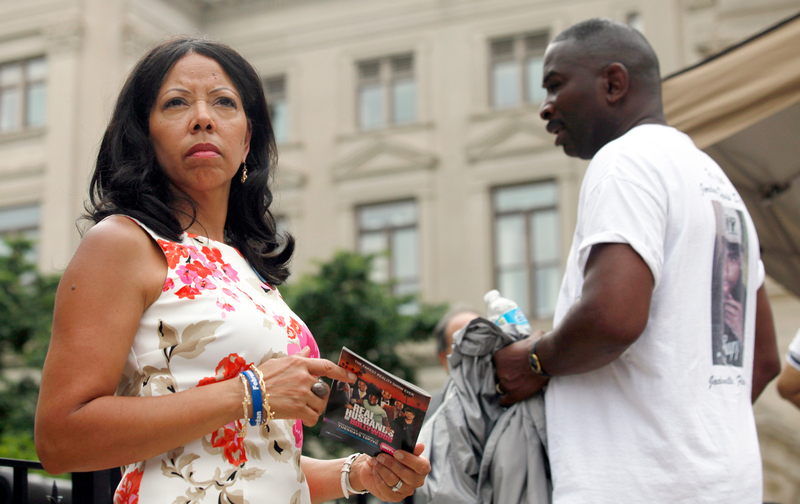 Lucy McBath, whose son was shot and killed in 2012, has jumped into the primary to take on Karen Handel in Georgia’s sixth district. Lucy McBath effectively put her Georgia state House race on hold when she got the news of the shootings at Marjory Stoneman Douglas High School on February 14. “We had to be there for these children,” she told me over coffee at an Emily’s List conference last week. McBath lost her own child, Jordan Davis, to gun violence in 2012, when a white man who didn’t like the music Jordan and his friends were playing shot him through an open car window at close range. His killer, Michael Dunn, invoked Florida’s stand-your-ground law in defense during trial. Devastated, McBath worked to keep the media from tarnishing her extraordinary son the way so many other young black victims have been diminished in death. After a mistrial, Dunn was convicted and sentenced to life in prison. McBath has been organizing, in some fashion, to be there for “these children”—from Jordan, to the first-graders of Newtown, to the Parkland survivors—ever since. McBath helped plan the March for Our Lives last month and organized a prayer vigil at Washington’s National Cathedral the night before. Sometime during that whirlwind, she developed a new plan: She would run for the House of Representatives in Georgia’s sixth district against first-term GOP Representative Karen Handel. Lucy McBath decided to move from a small state House race where she’d already raised more than $100,000 and was given a decent chance to win, to contest a US House seat that was the most expensive in history last year, when newcomer Jon Ossoff tried to become the first Democrat to represent the district in 40 years and narrowly lost in a special election. Handel is sitting on almost $1 million, and two of McBath’s three male Democratic rivals have written their campaigns big checks. McBath, by contrast, had to return all the money she’d raised for the state House seat and start over. She is also starting late; the primary is May 22. Two of her primary opponents have gained some traction in the activist community: Former local CBS news anchor Bobby Kaple is running on “affordable, accessible health care,” while Kevin Abel, a businessman and a South African immigrant who is Jewish, has attacked Donald Trump’s treatment of DACA kids and other immigrants. Having raised less than $50,000 so far, McBath is an underdog in every sense of the word, but she is also Lucy McBath, a nationally known activist and the only woman in a Democratic primary that will be decided by women. In the sixth district, roughly 60 percent of likely Democratic voters are women, and a quarter are people of color. McBath sees a path to victory, despite her late start. Still, if McBath makes it through the Democratic primary, this will be an epic race in an epic midterm year, pitting a conservative, white, pro-NRA, anti-abortion incumbent against a liberal, African-American, pro-choice, and pro–“gun sense” woman who toured the country as one of the “Mothers of the Movement” on behalf of Hillary Clinton in 2016. JW: So tell me why you decided to move from running for the state House seat to running for Congress. LM: I was lobbying in Denver—Colorado’s been doing some really good work on gun laws—and the minute I got off the plane my phone was blowing up over Parkland. I moved right into getting prepared to support the children. Getting prepared for the march. Organizing the event at the National Cathedral. That was the catalyst for me. I felt, my God, our kids are standing up, and nobody’s there supporting them? Our children are going to bat for themselves? I just thought that was unacceptable—we as adults weren’t standing up and doing the right thing. These are the civil rights leaders of their day and time. They’re the kids at the lunch counters, they’re the young people who were opposing the Vietnam War, they’re the kids who were fighting for civil rights right along with Martin Luther King Jr. This is a demographic we did not have in 2016. When I was traveling with the Mothers of the Movement, I cannot tell you how many millennials we met who weren’t voting. Our hearts were broken. They weren’t coming to the rallies. They would tell me, “My vote doesn’t matter.” I was a staunch Hillary supporter, but I have to applaud Bernie, he did get the kids out. So I just realized I’d have far greater impact to move the needle, on so many issues, in Congress. Plus, I’ve been working everywhere else, but people didn’t even know I lived in this district. How dare I not do it for my own community? That’s Jordan’s legacy. LM: You know when Trump had all those Congress members in to talk about guns, after Parkland? I was pissed off by that! They were making nice with him. Dianne Feinstein, I love her, but she was just sitting there smiling, they weren’t asking the right questions. They want to trade Fix NICS [a bill that strengthens the National Instant Criminal Background Check System] in exchange for concealed carry reciprocity? No! They want everybody to be able to carry their guns across state lines—no background checks, no training, they might be domestic abusers, but we’re gonna let them carry the guns anywhere they want? No! JW: How did the 2016 campaign, and your role with Hillary Clinton and the Mothers of the Movement, influence your decision to run for office this year? LM: All along people would say: have you thought about running for office? The entire time I was on the campaign trail with Hillary. I’d say: I’m not a politician! I really got a baptism by fire. I came to understand the depth of what it takes to be a public servant. Even though she didn’t win, that effort wasn’t wasted, not at all. She gave us confidence, so now we’re able to be the mouthpiece that she wasn’t able to be in the White House. We are that cadre of women who can push her agenda forward. I’m excited that I get to be a part of that process—that I get to carry out what she couldn’t carry out. JW: Are you still in touch with the other mothers? LM: We are still in touch. We text all the time. Everyone’s stayed active, everyone’s still on the trail in whatever way they can be. JW: And what about Hillary—has she endorsed you? LM: Not…verbally endorsed me [pauses, smiles]. But she’s my friend. JW: What has she told you?